Buy Products: If you want your car to look like new, you will need supplies. Here’s a list of the items you will need. Vacuum: Remove all of the floor mats and vacuum them. Power wash them if needed or spray them down with the hose. Use compressed air to remove dust from hard to reach places. Wipe Down: Use mild all-purpose cleaner to wipe down the interior hard surfaces with rags or paper towels. 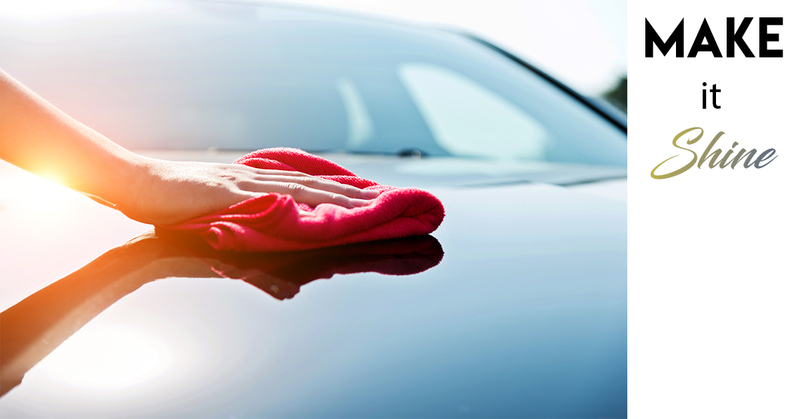 To help protect the interior surfaces from the sun, use a protectant such as Armor All. Use detailing brushes to clean interior vents. Clean Windows: Clean all of the windows and mirrors inside and out. Use a microfiber cloth to avoid leaving fibrous residue behind. Make sure you use a streak resistant window cleaner. Wash Wheels: Clean the tires with tire cleaner. Soak them in the cleaner for a glossy finish or wipe them repeatedly for a matte finish. Wash Exterior: Use car-wash detergent to clean the exterior. Do not use dish soap. Clean off any dead bugs with bug remover. Rinse the car without the nozzle on to help avoid water spots. Wax: Apply polish or wax using an orbital buffer or by hand.